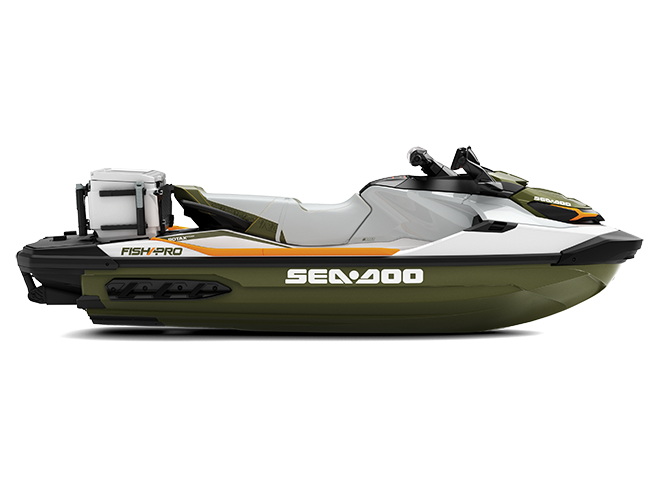 An industry first, the SEA-DOO FISHPRO is a combination of excitement, versatility, passion into one complete package. Explore all fishing locations, get closer to the action, and experience fishing like never before. Designed for ease of movement from the driver position to passenger for fishing. Optimized for fishing facing sideways with increased lateral stability when combined with the angled footrests. GARMIN† ECHOMAP† PLUS 62CV FISH FINDER	 A top-of-the-line navigation, charting and fish-finding system using CHIRP technology for high definition images. FISHING SEAT Optimized for ease of movement around the entire watercraft, and for better comfort and stability when facing sideways. LINQ™ FISHING COOLER & (4X) FISHING ROD HOLDERS	 A spacious, quick-attach fishing cooler designed for easy access and equipped with numerous convenient features. TROLLING MODE Gives superior trolling control at low speeds without using the throttle - simply set, maintain and adjust as needed. 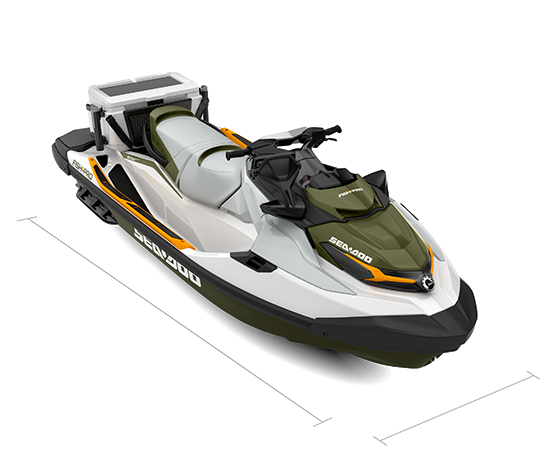 DISCLAIMER ©2018 Bombardier Recreational Products Inc., (BRP). All rights reserved. ™, ® and the BRP logo are trademarks of Bombardier Recreational Products Inc. or its affiliates. Products are distributed in the USA by BRP US Inc. Because of our ongoing commitment to product quality and innovation, BRP reserves the right at anytime to discontinue or change specifications, price, design, features, models or equipment without incurring any obligation. Printed in Canada. † All other trademarks are the property of their respective owners. Sea-Doo FishPro - Garmin ECHOMAP Plus 62cv Fish Finder with a 6-inch (15 cm) screen and in-hull transducer. A top-of-the-line navigation, charting and fish-finding system.